The first day after the rest day was a flat stage. While I appreciate the conundrum of planning the route that the Tour organisers will always face (especially from armchair critics like me), it would have been a more interesting stage if this one had been lumpier. There have not really been too many stages for the “rouleurs” – the likes of Phil Gil(bert), Edvald Higgs-Boson Haagen- Dasz (nickname courtesy of VeloVoices.com), or even Simon Gerrans. It has pretty much been sprint or climb. Anyways, the stage was characterised by a gutsy breakaway by a group of five riders led by Lieuwe Westra (Vacansoleil), Jerome Cousin (Team Europcar), Juan Jose Oroz (Euskaltel), Luis Mate (Cofidis), and Julien Simon (Sojasun). Two big ups and dues should be given to; firstly Westra who upon realising the gap was closing put on the turbos and relit the fire under the breakaway group, and secondly Simon who racing in his first Tour and it going through his home town put on a show for his dying grandfather who came to the roadside to see him race. The breakaway was always a threat given the winds blowing across the flat agricultural pastures (anybody remember Team Astana-pharma destroying the peloton in a flat windy stage in 2009? ), but they never got any further than 5 minutes ahead. Speaking of awesome agricultural displays, did anyone see the one of the huge bike in a field where all the parts were made of granite blocks? When I first saw this from the helicopter video I thought “ho-hum, just some more hay bales moved into place by a tractor”, but they weren’t hay bales – they were huge blocks of granite. Respect! When I heard Christian Prudhomme talking in Sydney before the Tour in May, he spoke about how there is a competition awarded to the best display. These guys have to win. The breakaway group was caught in last 10km with Simon being the last one to be wrapped up. Interestingly alongside from Lotto-Belisol (Gorilla Griepel’s boys), Omega-Pharma Quickstep (Manx-Missile Cavendish’s boys), and the Argonauts (Marcel Kittel’s boys) there was a lot of pulling in the last 30km by The Empire (Sky) and BMC. They obviously realised the potential threat of the wind breaking everything out and were adamant to be at the front. The sprint trains were quite disorganised with only really Lotto-Belisol getting their stuff together somewhat. But I think this had a lot to do with the route and the fact there were 4 sprint trains (including Cannondale) that were trying to lead. Two others were trying to form two from Orica GreenWedge andVacansoleil but they couldn’t get their act together. It all kicked up in the last two kilometres with the Gorilla’s boys kicking up and putting him in the gun position. 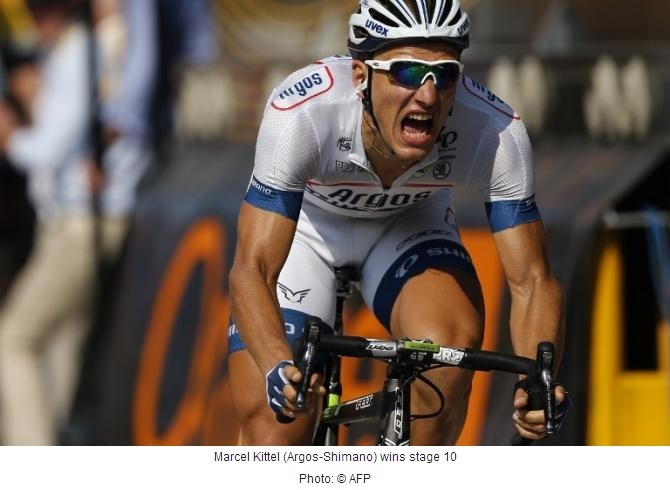 The Argonauts were hot on their heels giving Kittel a jump to chase down the sprinting Gorilla. Cav tried to fire his missile and in doing so took out one of the Argonauts at over 60km/hr – Ouch! But it was Kittel crossing the line first with his second stage win and a great sprint with all the players upright this time (compared to Stage 1). The Froome-dog is still in Yellow and the other jerseys are still on the same shoulders. The Yellow and White may change hands in the Individual TT tomorrow, but that is tomorrow. Side note – my boy, The Pok, loves the Gorilla! He keeps on asking me where the Gorilla is. During the Pyrenees stages he came up to me several times (he should have been in bed) to quite worriedly ask “Daddy, where is the Gorilla?” My only response was that he was eating bananas and they were being given out by a car at the back of the peloton. He was happy with that, for now. 5. Jens Voigt – because he is the Jensie. I jumped on the trainer again during the stage last night and it was a sweat fest. I rode for nearly an hour and a half. I realised getting out of the saddle that I need to get a longer stem for my road bike and have to slam down the spacers. My flexibility has increased considerably over the last 6-12 months and I find myself wanting to get in a more agressive position. Another session during the individual TT will need to be done. Vive le Tour!